Blockmans, W.; Prevenier, W. (1999). Edward Peters (ed.). The Promised Lands: The Low Countries Under Burgundian Rule, 1369–1530. Translated by Elizabeth Fackelman. University of Pennsylvania Press. ISBN 978-0-8122-1382-9. Kurth, G. (1908). "Burgundy". In Herbermann, Charles (ed.). Catholic Encyclopedia. 3. New York: Robert Appleton Company. Poupardin, R. (1911). 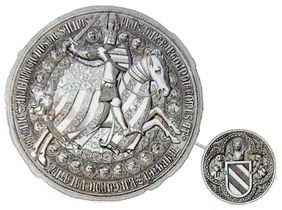 "Philip the Good (1396–1467)" . In H. Chisholm (ed.). Encyclopædia Britannica 11th ed. 21. Cambridge University Press. 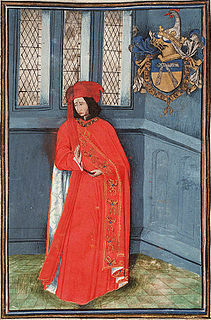 Amadeus VII, known as the Red Count, was Count of Savoy from 1383 to 1391. 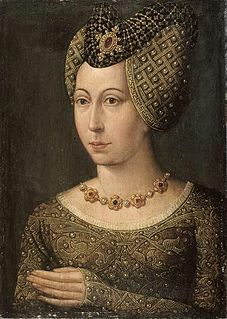 Isabella of Portugal was Duchess of Burgundy as the third wife of Duke Philip the Good. 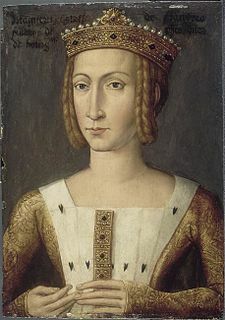 Born a Portuguese infanta of the House of Aviz, Isabella was the only surviving daughter of King John I of Portugal and his wife Philippa of Lancaster. 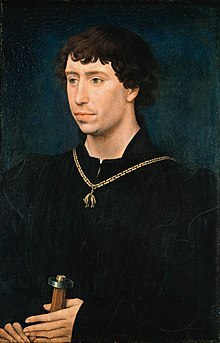 Her son by Philip was Charles the Bold, the last Valois Duke of Burgundy. 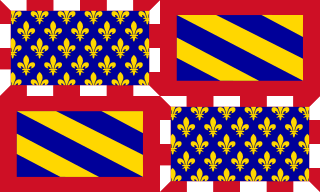 Isabella was the regent of the Burgundian Low Countries during the absence of her spouse in 1432 and in 1441–1443. She served as her husband's representative in negotiations with England regarding trade relations in 1439 and those with the rebellious cities of Holland in 1444. Lewis de Bruges, Lord of Gruuthuse, Prince of Steenhuijs, Earl of Winchester, , was a Flemish, courtier, bibliophile, soldier and nobleman. He was awarded the title of Earl of Winchester by king Edward IV of England in 1472, and was Stadtholder of Holland and Zeeland 1462–77. Jean de Villiers, Lord of L'Isle-Adam, was a medieval French nobleman, a Marshal of France, and Knight in the Order of the Golden Fleece. He fought in the Hundred Years' War and the Armagnac-Burgundian Civil War as a supporter of the Burgundian party, and sided with both the English and the French during different periods of his career. 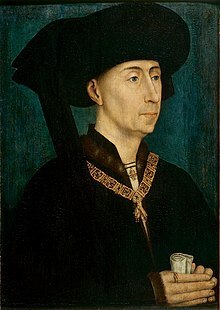 He held several important posts and offices on behalf of the King of France and the Duke of Burgundy, such as governor of Paris and of Bruges, and was killed in a rebellion in the latter.